This is a chess set of wooden chess that designed in giant size. Sized on 16 inch and carved perfect in chess pieces shapes. A chess set consists of 32 chess pieces, including 16 pawns, 4 Rooks, 4 Knights, 4 Bishops, 2 Queens and 2 Kings. All ages can play on this set, of course, but children will be especially delighted to play with it in yard, garden, and other outdoor area. Those are made of original Teak wood and has dried first. So that, those are durable product for outdoor use in any seasons. 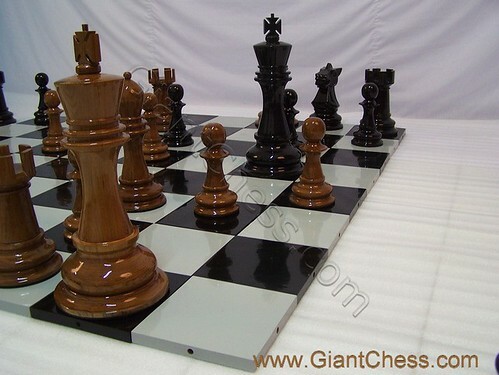 To support outdoor chess game, we also provide wooden chess board that has suited squares for the giant chess pieces. The playing surface for this chess set is a flat board of 8" x 8" squares. The white and black squares will accompany the chess pieces in the game.